On August 1-3, Ashley and I participated in one of the most remarkable professional development experiences of our lives. 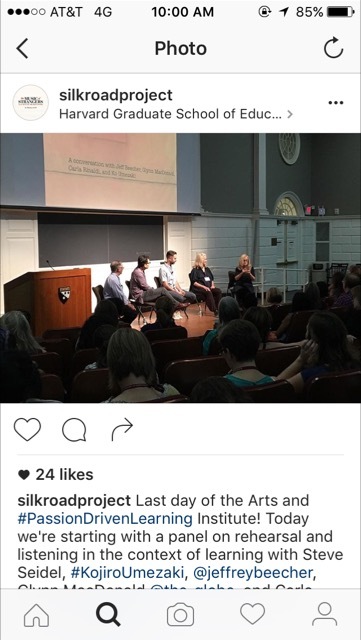 Arts and Passion-Driven Learning, a Harvard institute sponsored by the Arts in Education Program chaired by Steve Seidel brought together Yo-yo Ma, members of the Silkroad Ensemble, Carlina Rinaldi, Glynn MacDonald, Ron Berger and others. We could hardly believe the synergy and energy generated by the intersection and collective presence of these highly creative and accomplished people. We lived three intense, moving, thought-provoking, challenging and joyous days together with about 100 other educators from all over the United States and all over the world. 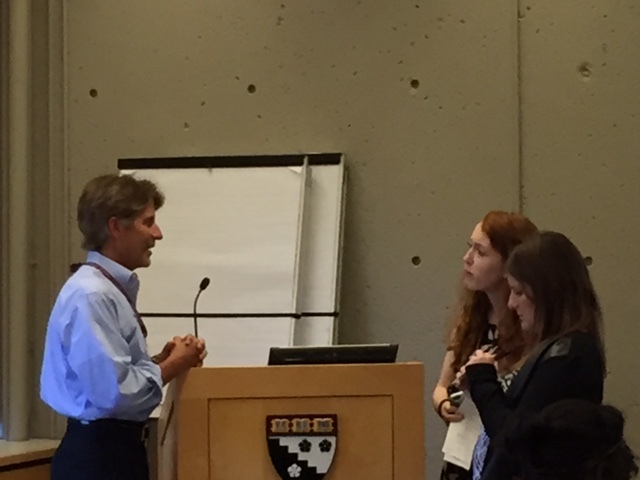 Last year I attended the Harvard institute, Future of Learning, which was similar in format, however, it was a much bigger conference. At both institutes we participated in workshops, plenary sessions, panel dialogues, evening events and dialogue groups. The Arts and Passion-Driven Learning program overview reads: As educators, we need tools to connect students' passions, and our own, to meaningful learning for the 21st century. The institute begins with a conversation between cellist and Silkroad Founder and Artistic Director, Yo-yo Ma and Steve Seidel, and continues with a rousing performance by the Silk Road Ensemble. Over the course of the program, Harvard faculty and Silk Road Ensemble members will present sessions where participants learn to create powerful learning experiences using the arts to connect students to their own communities and other cultures. How do/can we, as artists and educators, cultivate a practice of listening? How can listening to ourselves and our students support the development of passion-driven learning/learners? Carla Rinaldi is the person on the planet right now who can speak most eloquently and from decades of personal experience about the essential role and practice of listening for educators. We were thrilled to be at this institute with Carla and to link our own experience in continuous learning inspired by the work in Reggio Emilia with the broad scope of this institute. Glynn MacDonald was new to us and she is a force. She has worked at the Globe Theater with actors for years and started there with Mark Rylance. The very first hour we were up and moving with her, all 100 of us, learning how to embody the archetypes of king/queen, magician, warrior, and lover and the elements of earth, water, fire and air. These are now a part of my muscle memory and I will move with them as well as teach others gratefully. Yo-yo Ma and the members of Silkroad offered us vibrance, diversity, courage, beauty, and joy. We were swept away by their concert and the documentary about them, Music of Strangers. We were indeed privileged to participate in workshops with them and to make our own music. They are unstoppable and inspired cultural entrepreneurs. Yo-yo Ma shared his guiding metaphor that derives from the biological phenomenon, the edge effect, that the most dynamic, generative action in life happens between ecosystems. He compares that to his experience of music; that the most dynamic, generative action in music happens between the notes...when the musicians are listening with their ears and their hearts. And, he says, it's a practice...a skill and feeling that you can get better at. So it is with every relationship, certainly with our spouses and colleagues and children. Our experience, both personal and professional, is that the better one is at listening, the better one is at marriage and education. Ashley likes to think in this vein, that the really alive and generative classroom is like a really good jazz band, where all the players are listening deeply to each other and responding in creative ways. And, Ron Berger, now an old friend and colleague, never fails to inspire with beautiful examples of student work and an ethic of excellence. We were excited to see many examples of student work from The College School where we worked for many years in St. Louis, and also to learn of a new project about snakes that took place in 2012 with second graders at the Conservatory Lab Charter School in Boston. Please take a look at this short music video that they produced! We plan to sign up and return to Arts and Passion-Driven Learning next year. We can't think of anything we'd rather do. If you can possibly attend, please do. You will be inspired and uplifted. You will leave filled with renewed hope and courage...so needed in our old and honorable profession, in schools, and in the world.